With the support of Dalhousie’s School of Human Communication Disorders and the School of Dental Hygiene, the North End Community Health Centre offers free annual preschool screenings to ensure overall health at an early age. Read more on Dal News. For over 100 years, the Faculty of Dentistry has combined our high standard for clinical education with a commitment to making a lasting impact in our communities. Since we opened our doors in 1908, we have offered the highest level of clinical education to future oral health professionals. Today, over three-quarters of Atlantic Canada’s practicing dentists are Dalhousie-educated. Our impact on the region doesn’t begin and end in the classroom. It extends to our clinical care and outreach programs, which improve the oral health of over 26,000 patients across Atlantic Canada each year. At our main Halifax clinic alone, more than 100 dentists and dental hygienists support nearly 250 students in offering affordable, high-quality dental care to 10,000 patients annually. Each year, the Eldercare Clinic sees over 150 patients. The clinic not only provides senior patients a facility where their special needs are accommodated, but it also helps the students become more aware and sensitive to issues facing seniors. Read more. 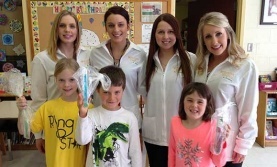 Second-year Dental Hygiene students Amanda Collins, Samantha Cicciarella, Katherine Allan and Megan White packed up their toothbrushes and floss and headed over to Grosvenor-Wentworth Park Elementary School where they were met by 86 eager Grade 1 students. Read more. In 2012, Heather Doucette, assistant professor in the School of Dental Hygiene, worked with her colleagues to develop a partnership with the Immigrant Services Association of Nova Scotia (ISANS), a community organization that provides assistance and services to the province’s new immigrants. Read more. View more Faculty of Dentistry community stories.